Taking over the former premises of now-defunct Botanist is yet another cafe, this time named Cheeky. 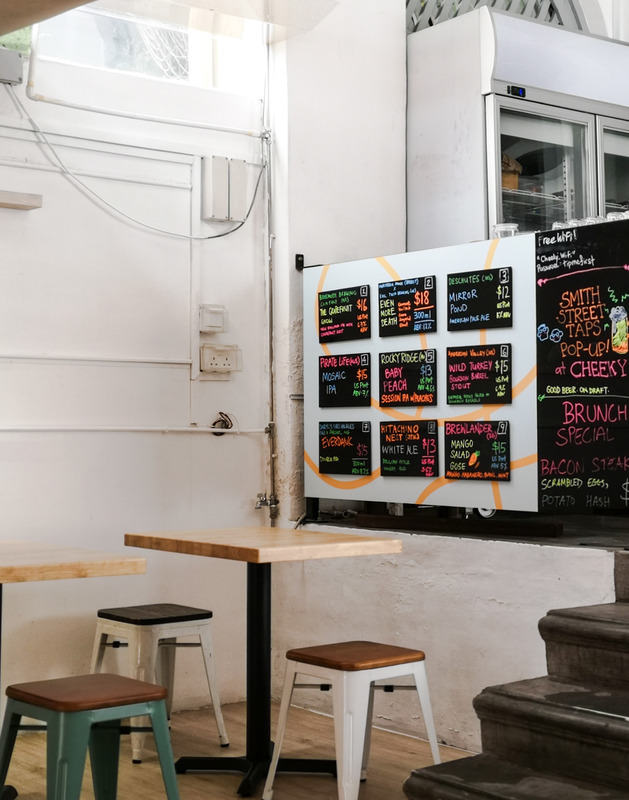 The Outram Park neighbourhood had seen quite a number of cafes and bars moving out of the late, including popular names such as Botanist and Hustle Co. which have had their presence made in the scene a couple of years ago. Opened pretty recently, Cheeky now occupies the premises vacated by Botanist; a space with a pretty unique layout with a shaded front yard that forms the dining hall, while the shophouse houses the kitchen as well as the washrooms. Having visited Botanist previously, it is worth noting that the large communal seatings of Botanist are now only limited to a few tables within the main dining area; mostly being replaced by two-seater and four-seater tables. While the furnishings and overall decor do remind us a little of its former tenant, much of the greenery is now gone, giving the entire space a more well-lit, yet minimalist feel without much distractions. While seats were available within the shophouse structure itself during the Botanist days, those seats have been removed. 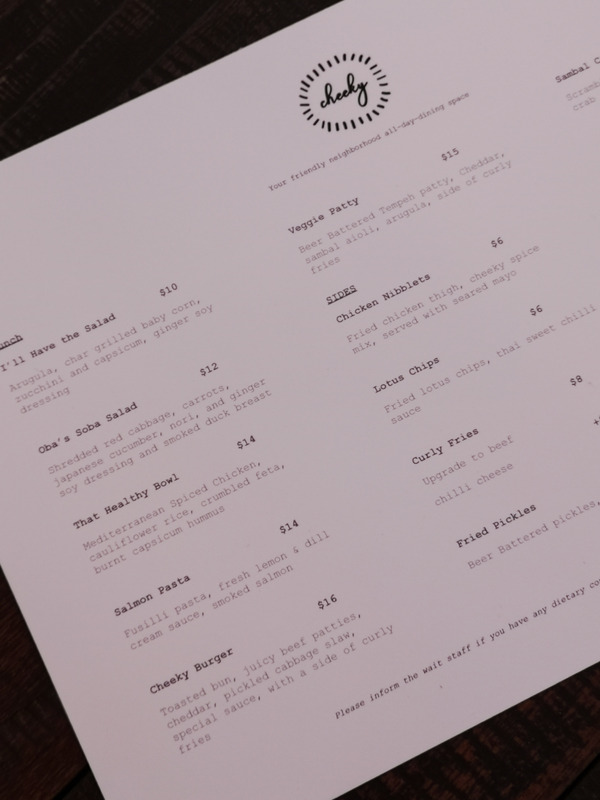 We visited Cheeky when they were still in their soft launch phase; the menu is restricted to only a couple of mains and sides, whilst also listing a few “sweets” as well. As mentioned by the staff who was serving us, more items would be added to the menu when Cheeky goes into official launch. Patrons who must pair their food with beverages would be glad to know that Cheeky serves up a wide variety of both alcoholic and non-alcoholic selections; the former including beer on-tap from Smith Street Taps, whilst the latter includes special concoctions of drinks, as well as speciality coffee brewed using beans of a custom blend roasted by the folks behind Two Degrees North Coffee Co., who also run The Populus Food & Coffee Co. just a few doors down the road. Going for one of the side dishes, we went for the Sambal Crab Scramble. 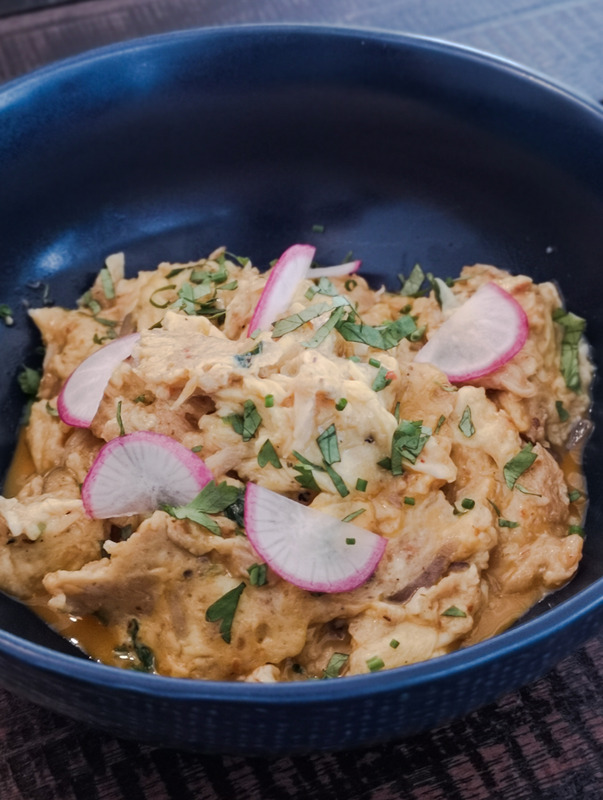 Described as “scrambled eggs with sambal chili crab on, red onions, and coriander”, this was a dish that is not really set to impress, but perhaps one that is created to be comfort food. No doubt the scrambled egg was a little less runny than what we would have preferred, but the sambal chili crab does remotely bring in similar flavours to that of the classic chili crab sauce; a slight hint of umami, yet sweet with a mildly spicy kick, with bits of crab meat to chew on. Rather appetising, and a great add-on for those who prefer something more brunch-like as compared to the other sides which are mostly fried. 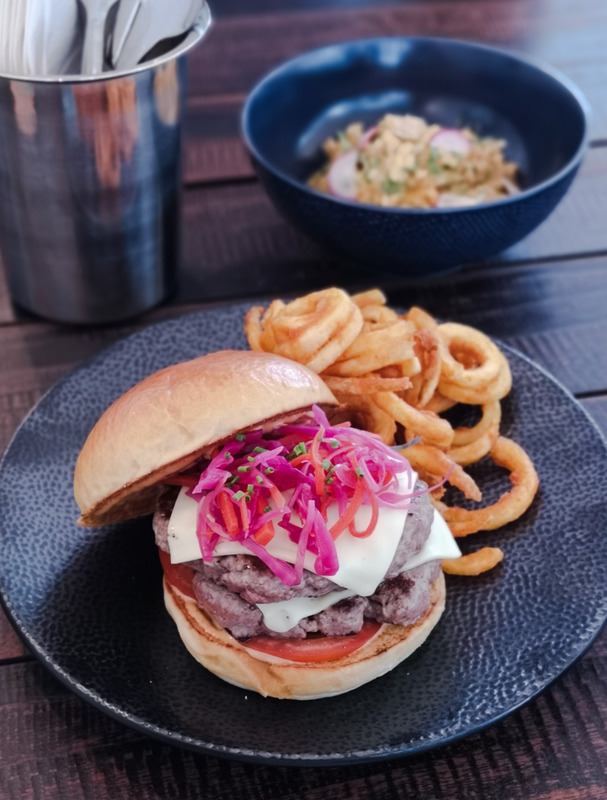 For our choice of main, we went for the Cheeky Burger; their signature burger is simple and fuss-free, featuring elements such as a toasted bun, beef patties, cheddar, pickled cabbage slaw, and special sauce, with curly fries on the side. The burger is pretty unpretentious; a rather decent beef burger considering how it is simply what it is; the beef patties, being the main star of the show, were pretty moist and tender without carrying any veiny bits that could be difficult to chew, whilst not being overly crumbly, while the sauce helps to provide a slightly more umami flavour. The other elements seem to play the lesser roles to the burger; not particularly prominent but their existence within the burger was certainly appreciated. We liked how the Cheeky Burger does come with curly fries as a side by default; those fries were well-seasoned and crisp, they are a sure favourite amongst the crowd considering how curly fries are so sought-after. 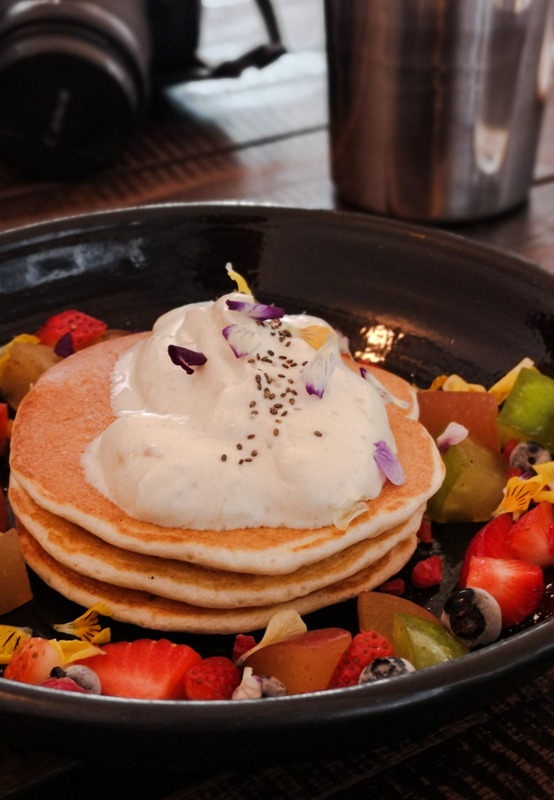 We also ordered the Pancakes, which came with Kaya Chantilly, seasonal berries and compress cinnamon apples. Whilst being more of a dessert item considering how it is being classified under the “sweets” section of the menu, the Kaya Chantilly is an item that would fit those who enjoy sweet treats for breakfast. The pancakes are well-sized; not overly big for a typical adult, and carried the aroma of buttermilk whilst being soft and fluffy. The Kaya Chantilly cream carries a light whiff of pandan fragrance in its finish, providing a slight local twist to the flavours going on here. While the compressed cinnamon apples were part of the novelty in ordering this dish, and an innovative take in terms of execution of the ingredient, we felt that they were a little out of place considering the somewhat raw, crunchy texture being a little stark against that of the pancakes; felt like an unnecessary addition somehow. Perhaps caramelizing the apples would have achieved a better effect overall. Initially wanting to go for a 5 Oz White, we ended up going for the Coffee Lemon after spotting this rather unique concoction on the menu. 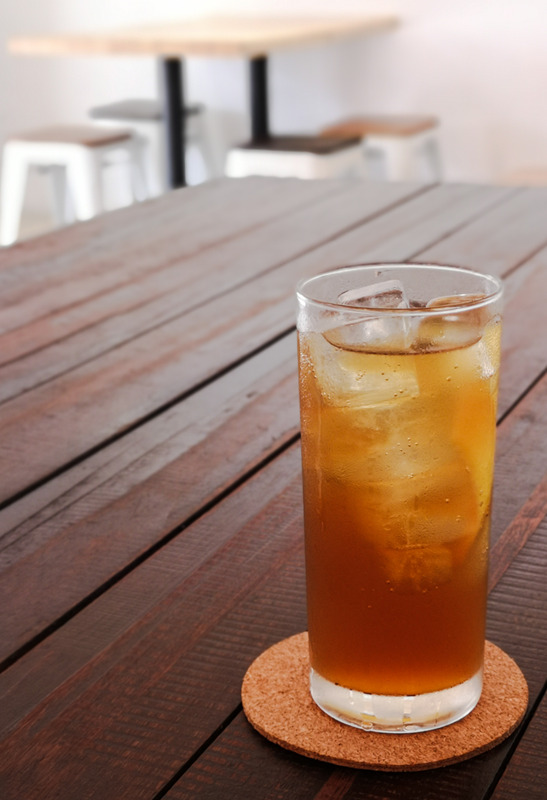 Being a mix of two other drinks on the menu, the Coffee Lemon is a concoction of Cold Brew Coffee, as well as Fizzy Lemon which includes soda. The beverage was a great palate cleanser; whilst starting off tasting like a lemon-lime drink, things start to change as one reaches the middle of the drink. The fruity notes of the Cold Brew Coffee compliment well with the zippy notes of the citrus-y fruits, providing a contrast of flavours that work well and feels pretty refreshing. Having tried a few items off Cheeky’s menu, Cheeky seems to be playing it safe; no doubt the items on the menu seem simple and hearty, but the mains do feel a little run-of-the-mill, lacking excitement especially given how they are named. That being said, perhaps the more interesting items would be making its debut when Cheeky is officially launched. Otherwise, the food at Cheeky was pretty decent, while service was also the same as well. Given its vibe, Cheeky does make a decent spot for brunch in the day, as well as an after-work hideout for a couple of drinks in the evening with its unique layout; a spot that adds yet another dining option in the area.